On a ledge 1738 feet (530 meters) above Simadalsfjorden in Hardanger, iconic Kjeåsen is located. With its spectacular view, the farm has received much acclaim in television and travel magazines. Now, the property is put up for sale. 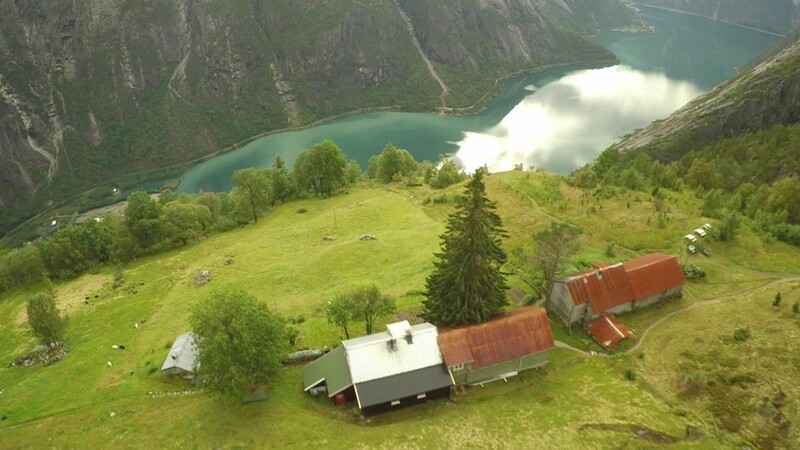 Far from urban lifestyle and up the precipitous mountains, lays the old farm Kjeåsen – probably named after baby goats “kje” and “åsen” meaning hillside. It is both a cultural heritage site and a tourist attraction in Eidfjord municipality. The area is not densely populated – which is an understatement. Norwegians, however have an inherent urge to settle off the beaten track. – It would be nice to have neighbors, says Bjørg Wiik to NRK. Since 1967, she has lived close to the capricious nature in the mountains. 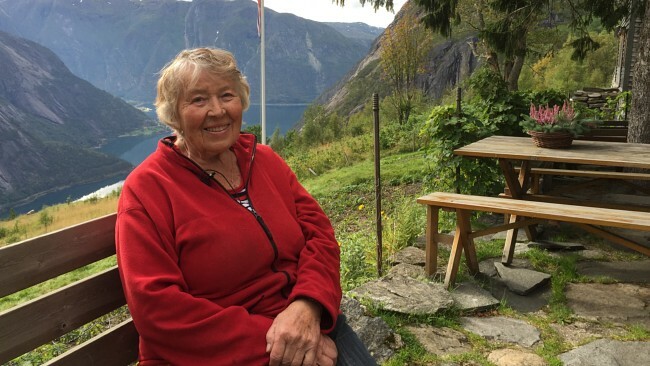 She moved from Oslo to help her aunt, but has lived there ever since. In recent winters, she has temporarily been living in Oslo, but the mountain is her favorite habitat. -Up here, the air is fresh and I enjoy my freedom. It is paradise, she says. It is uncertain when the first settlers arrived Kjeåsen, but the houses on the farm was built around the 1900s. At that time, there was no road up the hills. Since the owners moved in 1962, Bjørg Wiik has seen the neighboring farm deteriorate, so unfortunately the buildings are characterized by a lack of maintenance. The ad does not deny that extensively renovation is necessary. – It is sad to think that things will lapse, Bjørg says. She often reminisces about the old days. Before the road came in 1974, everything had to be carried up and down the precipitous mountain by either horse and carriage, oxen or man power. The thirteen children growing up in Kjeåsen in the 1900s walked up and down to go to school. The property is licensable. Because of the property’s character and location, there are certain requirements to safeguard the unique cultural landscape. Whoa! That makes me dizzy just looking at the cliff. Wow I gotta check it out!